Jackal’s Den main server is a great place to play and build. But, sometimes, we want something out of the ordinary to shake things up. For this, we have a dedicated games server. This is where we hold gaming events such as minigames (Proximity, anyone?) or UHC competitions. You will find it helpful if you join us on Teamspeak (free!) for the games. If you don’t have a headset, or for whatever reason you cannot do voice chat, you can always listen in on Teamspeak and type your comments in-game. But, speaking from experience, it is much easier and more enjoyable when you can just talk to your teammates and/or opponents. The main server remains up during events, so if you’re not interested in a game, you can continue building your base or putting the finishing touches on your new mob farm while other players are off killing each other. UHC is where participants are set into the wild of a small-ish map, with nothing but a Golden Apple and a random item, and they have to outlast all the other players. Besides the exciting nature of this survivalist PvP game, one of the fun features of the UHC competitions is when a player is killed by another player, the victor gets the player’s head to take back to the main server as a trophy. Sadly, any player heads you have when you’re killed will be dropped, along with all your other items, to be picked up by the surviving player. So if you don’t win the competition, you take home nothing. The winner of the competition takes all! This is a teams-based PvP game that takes place on nine (9) completely detached islands floating over the Void. Each team has its own spawn island, opposite each other on the map. Next to the spawn islands, in the four corners of the map, are a ‘tree’ island and a ‘spider’ island each. The center of the map has a lava island with a point in the center where random “treasures” are occasionally released, though the word ‘treasure’ is often a dubious distinction… the item is not always worth the risk of getting there. The remaining two islands have an Iron Golem spawn point (iron!) and an enchanting table, respectively. It is necessary to build bridges to move from one island to the next. Adding to the challenge, opposing players are invisible to one another unless there is at least one member of each team on the same island at the same time. However, items you hold in your hand are visible, so that sword you’re holding could get you killed. 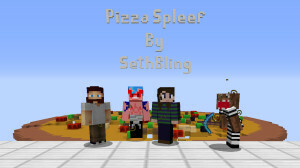 Pizza Spleef is a fast-paced game in which you try to make your opponents fall out of the world by digging out from under them with your only tool: a pickaxe. The setting is a giant floating “pizza” with different types of blocks representing different toppings, each of which offers a boost or item to help you. Some toppings make you invisible for a short time. Some toppings turn out the lights for other players for a time. Some give you Creeper eggs or splash potions. Some give you jump or speed boosts. And then there’s the dreaded center topping, which will give all the players except the one who broke it a woozy effect for the duration of the game. The last player still in the world is the winner. The Dropper minigame is a puzzle type of game, with levels of increasing difficulty. The object is to drop down a hole and during your freefall descent, attempt to land on a small, safe target. Failure results in death, and your deaths are tallied and ranked against the other players. In the advanced levels, there’s more to it than simply landing on a target, but you’ll have to play the game to figure them out! These puzzles can be frustrating but fun challenges. Nail is an exciting invaders versus defenders PvP mini-game in which the invaders attempt to breach a castle wall and capture the defenders’ sponge. Cooperation is key if the invaders hope to have any chance of succeeding in their goal. Both sides have a wide variety of weapons at their disposal, including a TNT cannon defending the castle!